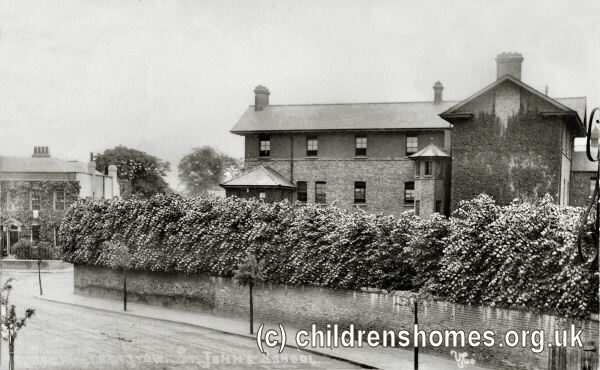 The St John's Industrial School for Roman Catholic Boys was officially certified for operation on October 28th, 1870, in premises at the junction of Shernhall Street and Church Lane, Walthamstow. It could accommodate up to 190 boys, aged from 6 to 12 years, placed by magistrates under the Industrial School Acts. St John's was established to relieve the overcrowded conditions at the St Nicholas Industrial School at Little Ilford, which itself had vacated the Walthamstow site in 1868. The location of the School is shown on the 1896 map below. St John's Industrial School for Roman Catholic Boys site, Walthamstow, c.1896. On 14th January, 1899, charge of the School was taken over by Brother Director Arthur Doyle and two brothers of the Order of Mercy. In 1906, the inmates and staff of St Edward's Reformatory at Plaistow were transferred to the St John's site, which was from then on known as St John's Reformatory School. The School was officially certified to operate as a Reformatory on January 26th, 1906, accommodating up to 126 boys, aged from 14 to 16. Inmates.—Total number in school, 125; voluntary cases, 0; on licence, 16; absconders, 1. Staff.— Superintendent, Mr. W. McGee. Assistant superintendent, Mr. Edward McGee. The shoemaker resigned 3rd July 1909; new appointment pending. Premises.—Clean and in good order. Standards with awards.—Standard VI, 21, very fair; Standard V, 18, fairly good; Standard IV, 26, good; Standard III, 23, good; Standard II, 18, good; Standard I, 14, good; Preparatory, 4, good. The general award is good. Handwriting and reading, especially the latter, require special attention. Class subjects.—Singing—sol-fa, good. Composition in V and VI good. Recitation, very fair in I., fairly good elsewhere. Mental arithmetic, fair in V and. VI, good elsewhere. Geography, good throughout. History readers have been used. Industrial training.—Drawing is good all through; in the application of geometry to design, this school is unapproached. The same remark applies to the decorative wrought-iron work, in which department, as well, the technical instruction is of a high order. Manual instruction in woodwork is again good. In both horticulture and tailoring the instructors must be complimented. Members of the cookery class gained three medals and four diplomas in competition at the recent Universal Food and Cookery Exhibition. Of 121 boys now in the school, and who are 14 years of age or over, 92 are regularly engaged in skilled occupations; of the remainder, 27 boys who are whole-timers in the schoolroom receive one and a half hours' practice daily in the shops. Of 41 boys who left the School during the past year 37 entered skilled occupations. The brass band is 43 strong; and the string band 8. Judging by performance, the latter is well worth encouraging. Physical training, &c.—A large squad gave a first-rate display of well arranged free exercises, and the applied work vas equally good. These boys move wonderfully well, and enjoy the exercises. Another point worth noting is that they look bigger out of their clothes than in. Boxing and wrestling fill up the niches of more general work. The school holds the football and cricket cups for senior schools, carried off 11 first prizes. at the recent South of England Schools' Sports, and won five first prizes at the Inter-School Swimming Gala last autumn. A rifle club has been formed. Health.—A boy broke both wrists while at play in the yard and another sustained a green fracture of the wrist. There were several cases of sore throat in September. Single cases are recorded of blood poisoning, corneal ulcers, tubercule, subacute appendicitis and tonsillitis. There was a serious case of pneumonia in December, but a good recovery was made. The boys looked thoroughly well at the inspection. Conduct.—Five cases of absconding are recorded, and a few of impudence, fighting, lying, and petty pilfering. The general tone of the school is sound. General remarks.—Thoroughly capable management and earnest solicitude for the best welfare of the boys have established this school in the very first rank. Despite a decline in the number of boys being placed at the School, it continued in operation until 1932 when it resigned its Reformatory certificate. The site, then renamed Wiseman House, became a Certified School, housing up to 120 boys placed by the Poor Law authorities. The premises subsequently became St George's RC Secondary School and is now the Wiseman House site of the Holy Family Catholic School and Sixth Form. Catholic Children's Society (Westminster), [formerly the Crusade of Rescue] 73 St Charles Square, London W10 6EJ. To enquire about access to the records of a child who grew up in one of the Society's homes, fill in the request form on the Society's website.